At the heart of all our yearnings is the longing to come home. What does it mean to come home to our true nature and to our place in all of nature? In this, the Year of Homecoming, Susanne Olbrich and Margot Henderson weave together piano music, poetry, story and song, inviting their audience on a journey home to themselves and to the present moment. Poetry by Zen Master Thich Nhat Hanh and Margot's original work explore with depth and humour human interconnectedness with nature and the wonders of life. 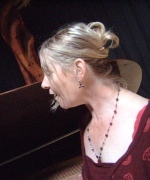 Susanne's compositions for piano blend contemporary jazz, classical, tango, Celtic reminiscences and other influences.